Sigma Beta Delta traces its beginnings to June 19, 1986, where, at a Beta Gamma Sigma Long-Range Planning Committee meeting in Williamsburg, Virginia, the decision was made to thoroughly examine its relationships with schools that had regional accreditation, but not specialized accreditation in business. In subsequent discussions, Beta Gamma Sigma leaders acknowledged that the business honor society is a vital participant and positive force in higher education, and should be available to all regionally accredited baccalaureate institutions. The culmination of the discussions was a decision by the Beta Gamma Sigma Board of Governors in January 1994 to establish Sigma Beta Delta. Seven founding chapters were established early in 1994. They include: Belmont University, Houston Baptist University, McKendree College, Morehouse College, North Carolina State University, Saint Leo College and Southern University. By the end of the chartering period, June 30, 1995, an additional 54 charter chapters had been installed for a total of 61 founding and charter chapters. Today, over 350 chapters have been established in 47 states. Three international chapters have been established: American University of Kuwait, Kazakh-American Free University and United Arab Emerites which was the first international chapter. 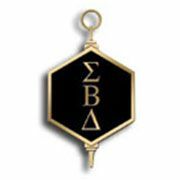 The creation of Sigma Beta Delta follows a 200-year tradition of honoring scholastic achievement in higher education, beginning with the establishment of Phi Beta Kappa in Williamsburg, Virginia, in 1776. SBD is an invitation-only organization. Eligible students will receive an invitational letter and email during your qualifying semester. The correspondence will contain steps to join. You must accept the invitation by the deadline indicated. The lifetime membership is a one-time fee of $65 which includes your certificate of membership, a golden SBD lapel pin, fellowship and networking opportunities, a lifetime of honor and recognition, and yearly newsletters. An induction ceremony and reception will be held each semester for new initiates and their guests. If you are unable to attend, we will be glad to make alternate arrangements for you to be inducted so that you can still receive the benefits of membership in Sigma Beta Delta. The purpose of Sigma Beta Delta is to encourage and recognize scholarship and accomplishment among students of business, management and administration, and to encourage and promote aspirations toward personal and professional improvement and a life distinguished by honorable service to humankind.